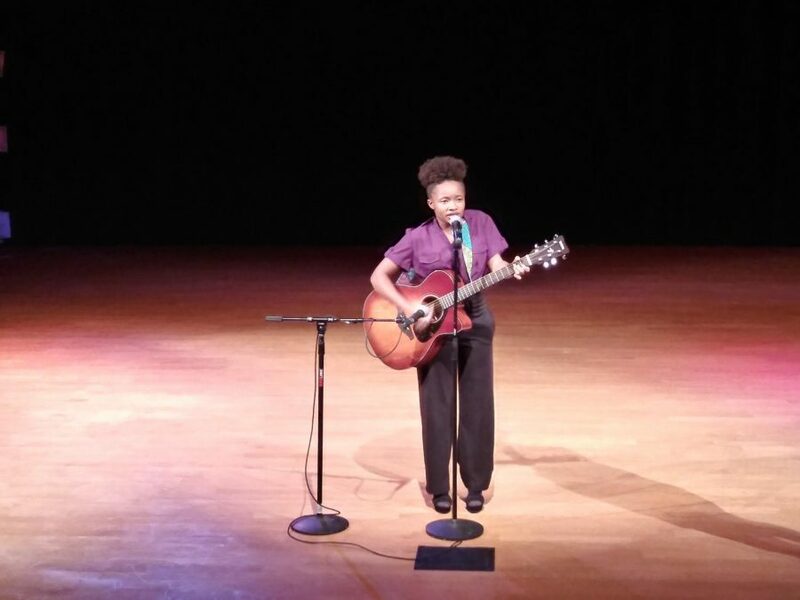 Marquette Winston, 16 years old, performing live at Twisted Storytellers in African American Museum in Detroit. Marquette Winston is a local 16-year-old musician and a senior at Canton High School. Marquette sings and plays guitar, and has been since she was two years old. You may see her performing at the PARC, the Coffee Bean cafe, or busking (performing) on the corner by Sun and Snow in Downtown Plymouth. At times, she is accompanied by her good friend Joe Jankowski, who plays the drums, and perhaps a few other friends. A lot of times she is rocking it out solo. In-The-Band-Studio is a local organization that guides musicians, like Marquette, to get discovered. The organization holds open mic nights, benefit concerts, and other performances at the PARC in Downtown Plymouth. InTheBandStudio helps so many musicians display their talent.